Where are the main Bolsonaro strongholds in Brazil? President-elect Jair Bolsonaro (PSL) gained the confidence of the population in the country’s Southern region in an impressive way. In all three states of the region – Paraná, Santa Catarina and Rio Grande do Sul, he won with over 60 percent of valid votes (see infographic). In Santa Catarina alone, he received 75.92 percent, and in ten cities of that state he obtained more than 80 percent of the voter. Santa Catarina’s governor-elect, Comandante Moisés, who was elected with 71 percent of valid votes, belongs to the same party as the new president. The city with the most significant voting for the PSL presidential candidate, in terms of the proportion of valid votes, lies in Rio Grande do Sul’s Serra Gaúcha region and has little over 2,500 inhabitants. The small town of Nova Pádua registered 92.96 percent of valid votes for the Army reserve captain. Out of a total of 1,904 votes casted in the municipality, 1,770 were in favor of Jair Bolsonaro. Nova Pádua was settled by Italians from the Veneto region in 1866. The immigrants were fleeing the poverty caused by the war against the Austrians, who were trying to unify the country. Initially called 16ª Légua do Campo dos Bugres, the name of the city was changed after the blessing of an image of Santo Antônio de Nova Pádua. The emancipation of the municipality, which was initially a district of Caxias do Sul and, afterward, of Nova Trento–Flores da Cunha, came in 1992, after being approved in a referendum. With a predominantly agricultural economy, the city still maintains the tradition of using the Veneto dialect, a cultural trait of that Italian region. Also from Italy came the predominance of the Catholic religion, evident in several feasts celebrating patron saints. The local industry invests in the production of wine, and 27 wineries employ most of the city’s labor force. The municipality developed quickly, and obtained in 2006 the 1st place in UNICEF’s list of cities with the best Child Development Index. With that title, Nova Pádua becomes known all over Brazil. The state which most supported Jair Bolsonaro for the office of President of the Republic had in the municipality of Rio Fortuna its most impressive result, with 89.63 percent of votes going to the PSL candidate. Out of 3,663 votes tallied, 3,283 were in favor of the president-elect. With a population estimated by IBGE (Brazilian Institute of Geography and Statistics) in little over 4,600 people, the municipality’s main economic source is agriculture and cattle raising. Its main crops are corn, tobacco, beans, and, more recently, pine and eucalyptus trees. The raising of cattle for milk is also a staple in the industry of the city, one of the state’s main dairy producers. Recently the city has been exploring its enormous potential for the extraction of the fluorite mineral, used in the production of industrial fluorine. The discovery of this ore made the city’s economy make a significant leap. According to IBGE, the city’s Municipal Human Development Index (IHDM), which was 0.65 in 2000, now is 0.80, and the GDP per capita, which used to be R$ 20.5 thousand in 2012, went to R$ 50 thousand in 2015. Rio Fortuna’s name came from a hunt organized by the region’s first settlers. According to the book “Rio Fortuna: Nossa Terra, Nossa Gente” (“Rio Fortuna: Our Land, Our People”; Record: 1997), written by Roberto João Tenfen, among the first immigrants to settle in the region of Rio Fortuna were natives of the Azores. Coming from São Pedro do Capivari (SC), these settlers subsisted through hunting. At the time, topographers of the Land and Colonization Company were in the region to demarcate lands for the colonists. Aided by the hunters, topographers killed two tapirs. The animals fell into the river, which had not yet received a name. After witnessing the feat, the hunters uttered: “Glückfluss!”, “fortunate river”; the river then received the name of Fortuna, which would later be used for the town itself. Besides the Azorians, the city was colonized in 1872 by descendants of Germans who came from Anitápolis, Teresópolis, Tubarão and São Pedro do Sul (present-day Armazém). When they arrived at the lands of Rio Fortuna, the first settlers met the local native indigenous people, who belonged to the Xöklen tribe, the first inhabitants of the region. In the state of Paraná, the population dedicated 68.43 percent of their preference for the Army reserve captain. But there are cities who voted massively for the PSL candidate. Bolsonaro’s biggest voting came in the municipality of Quatro Pontes, with 2,509 votes for the captain, out of 2,913 registered votes, the equivalent of 86.13 percent of valid votes. With a little over 4 thousand inhabitants, the small town of Oeste is only 25 years, and began to be settled around 1950 by a logging company who divided the land into 25 hectare lots and invited settlers from Rio Grande do Sul and Santa Catarina to work in clearing the woods and in the logging operation. However, after the deforestation had been completed, the land was deemed improper for the cultivation of coffee, at the time the state’s main crop. The raising of pigs was the solution found to generate revenue in the region, and is still of the city’s staples. With the 1970 agricultural modernization, the cultivation of soy became viable in the region, but the lots were still too small to handle soy production; landowners then began to acquire neighboring lots to enable the new crop. In 1993 it ceased to be a district of Marechal Candido Rondon, and became the municipality of Quatro Pontes. Its population is predominantly German, and their tradition can still be seen in the local feasts. Jair Bolsonaro also had an expressive voting in the country’s biggest cities. Out of the fifty cities with the biggest number of electors, he was able to gain a majority of votes in 45. The figures were especially remarkable in Brasília, where he obtained 69.99 percent of valid votes, in Curitiba, where he got 76.54 percent of valid votes, and Goiânia, where he received 74.20 percent of valid votes. In Joinvile, a Santa Catarina municipality with almost 400 thousand voters, Bolsonaro obtained 83.18 percent of the electorate, that is, out of the city’s 315.5 thousand votes, he received around 262.5 thousand. 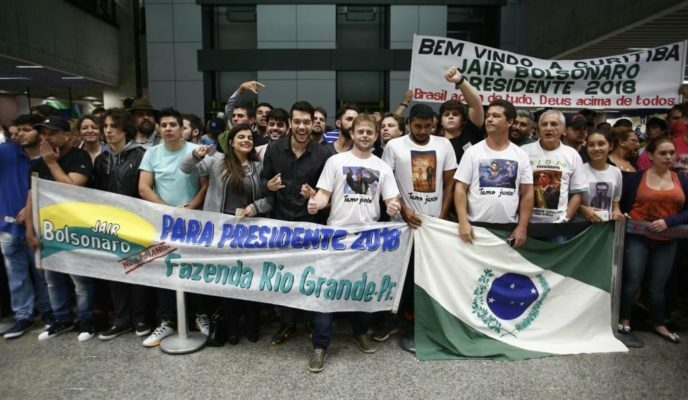 Onde ficam os maiores redutos bolsonaristas do Brasil?